An interesting tension exists in the socio-cultural plane in Niger as it does in many West African countries. Nigerien men generally operate outside of the household as the “breadwinners,” making a living toiling in economic spheres such as agriculture or mining. Women, on the other hand, are the nurturing caretakers, responsible for critical tasks in the home such as cooking, cleaning, caring for children, and gathering essentials like water and wood. Though much of Nigerien men’s time is spent in the “public” sphere, they are also the primary decision-makers in the home. Men have the final say in all aspects of the marital relationship, the rearing of children, and how home life functions. The disconnect is clear – it is women who spend nearly all their time in the home, responsible for all of the domestic duties, but it is the men who dictate how things run. How, then, can men make informed choices about such issues as reproductive health or child care? Furthermore, as decision-makers, how can Nigerien men be more physically present and active in the home? Enter “husband schools.” In 2004, the United Nations Populations Fund started to implement husband schools as a way to bridge the gap between responsibility and experience – providing the male head of the house with the critical knowledge he needs to support and attend to the needs of his partner, family, and community. 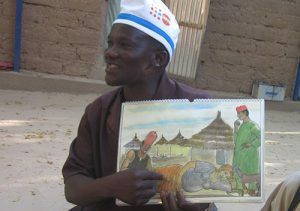 The initiative spread in Niger’s Zinder region, educating men on reproductive health, family planning, nutrition, the importance of sharing responsibility for domestic chores, and other topics (Women Deliver, 2016). Nearly fifteen years later, the positive outcomes produced by these schools prompted outside organizations to jump in and establish their own, and now, it is estimated that there are a couple hundred such schools in villages throughout Niger. Each husband school (HS) is comprised of approximately 10 members and meets twice a month. Seeking to engender fruitful discussion and meaningful long-term results, schools target married men with good morals who are at least 25 years old and can read and write (Ali, et al). Husband schools use a model based on peer support and discussion. This ensures that meetings are centered on members’ sharing of personal experiences, thoughts, and feelings. There is no one leader of the group, however, sometimes specialists (e.g. teachers, ministers) are brought in to speak on a particular issue if timely or necessary. In addition to being a space for dialogue, husband schools also aim to help men to develop practical strategies and techniques for addressing the various issues affecting their families and community. For example, an HS might “devise strategies to encourage more pregnant and breastfeeding women to attend Integrated Health Centers,” figure out ways to make the most nutritious meals or design the ideal mosquito net for their home (Women Deliver, 2016; Anderson, 2018). The goal is to not just have this important information conveyed by members to their families but to ensure that it is disseminated to the community at large as well. It is the hope that HS members feel knowledgeable and empowered enough from their time at the HS to reach others with the lessons they have learned. This spread of knowledge may be casual in everyday interactions or more specifically directed. One school, for example, “writes and presents sketches or plays on the themes that it promotes in public places, during ceremonies or any other opportunities in the community to raise awareness. The model husbands also promote hygiene and regularly organize public health days in villages, install ‘tippy-tap’ handwashing stations and build indoor toilets in houses.”(Ali, et al). Husbands from one school have “constructed a midwives’ residence, an observation room for women in labor, and a prenatal consultation room” (Women Deliver, 2016). Though noble in mission and continuing to improve in efficacy and structure, husband schools have not come without challenges. One obstacle the initiative and its members have faced is that the very premise of husband schools is in direct opposition to the traditional beliefs about marriage, parenting, and family life in Niger. This had led to skepticism and reluctance to participate by many Nigerien men. Alhaj, a longtime HS member and father of eight living in a Nigerien village known as Angouai Gao, explains, “There were people saying this was a bad thing…but I never cared about what they were saying. I was excited to join the group and I stayed” (Anderson, 2018). In addition to this cultural pushback, there is the obstacle faced in retaining members who first and foremost shoulder the responsibility for their family’s survival in, particularly harsh living conditions. One organization describes, “the main challenge in operation of the HS is the exodus of members during the ‘hungry’ or lean season” (Ali, et al). A desire to talk about and learn the tools to improve family welfare understandably falls to the wayside when a husband is not even sure if he can put food on the table every day. Despite these issues, research shows that there are positive impacts within individual homes and long-term gains in the communities served by these schools. Members describe how communication and cooperation in marital relationships improve after attending husband school. One says, “I’ve learned how to give my wife advice about exclusive nursing. I help her with housework. I take the child[ren] when she is cooking.” Another student reported, “When [my wife] has a lot to do, I take the children so she can be free to do another activity…I do whatever I can to help the children” (Anderson, 2018). – Use of family planning services has tripled in communities where the schools operate. – During the first nine months of 2013 in Maiki, approximately 1,700 women received prenatal consultations at the health center, a 95 percent increase from 2012. – The number of childbirths attended by skilled healthcare personnel has doubled in communities where the schools operate. – An increase in rates of safe delivery, from approximately 12 percent to nearly 30 percent in one community and from 16 percent to over 32 percent in another between 2008 and 2009 (Women Deliver, 2016). Husband schools use a contextualized understanding of private relationships and social dynamics to effect change. By directing their efforts towards the individual who wields the most power and influence within the home, husband schools have had significant success ameliorating some of the deep-seated problems facing Nigerien families and communities. Anderson, Maggie. “Why We’re Inviting Men to Husband School.” Mercy Corps, 4 June 2018, www.mercycorps.org/articles/niger/why-were-inviting-men-husband-school. “Husband Schools: Bringing Men into Family Planning – Women Deliver.” Women Deliver, 19 Sept. 2016, womendeliver.org/2016/husband-school-teaches-importance-contraception-niger/. Idrissa, Ali, et al. “Back to School: The Role of Husband Schools in Maternal and Child Health and Nutrition in Niger.” Management of Hypertension and Diabetes for the Syrian Refugees and Host Community in Selected Health Facilities in Lebanon | ENN, www.ennonline.net/nex/9/husbandschoolshealthnutniger. “Schools for Husbands Gaining Ground in Rural Niger.” United Nations Population Fund, 17 June 2014, www.unfpa.org/news/schools-husbands-gaining-ground-rural-niger.